The Hough Transform – An Amazing Tool. Part of my job is understanding and pushing the limits of each part of our systems. 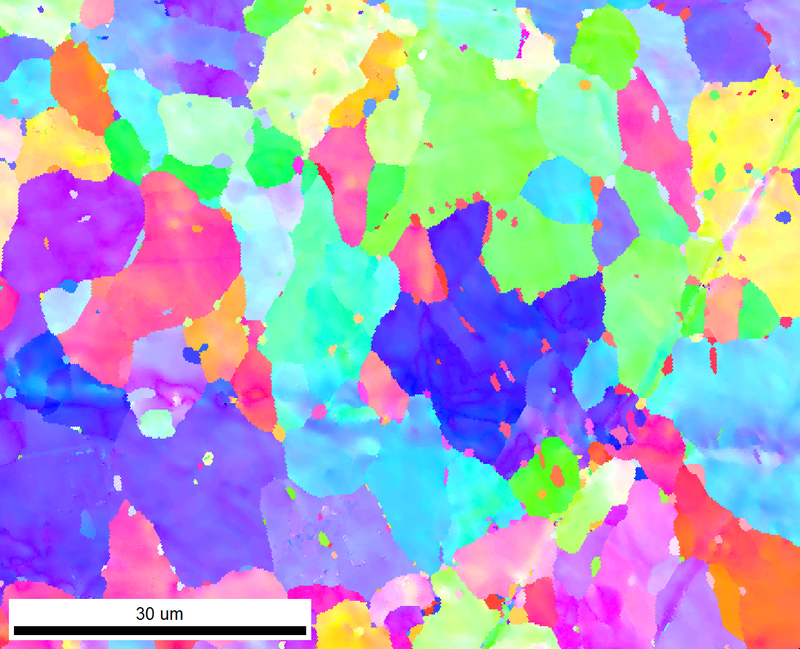 One of the most fundamental parts of the EBSD system is the Hough Transform. The Hough Transform role is finding the lines on an EBSD pattern. This is the first step in indexing a pattern (Fig. 1). If this step is not consistent, the quality of any indexing and any derivative data is questionable. A normal user does not really need to understand all the intricacies of every part of the system, but it still is worthwhile to understand how your data and data quality can be affected. Figure 1: On the left are the overlaid lines found via the Hough Transform. On the right is the Indexed solution overlaid based on the Hough. The quality of the indexed solution is based on the quality of the Hough. With that in mind, I ran an experiment on a steel sample to see how far the Hough could be pushed and still give consistent indexing. For this experiment, I used our Hikari Super at a series of different binnings between its native resolution of 640X480 Pixels at 1×1 binning down to 35×26 pixels at 18×18 binning. All pixel resolutions are noted in Table 1. I kept my Hough Settings and beam settings consistent. My only other variable was exposure to get the camera to be equally saturated at around 0.85 saturation. I expected the lower binning Patterns to be consistent and they were (Fig. 2). All three Euler Angles between the 1×1, 2×2, 4×4, and 8×8, were within 0.4 degrees of each other. Pushing the camera and the Hough even further really surprised me though. Figure 2: Indexed Pattern for the lower binning showed a remarkable consistency in indexing. Figure 3: The indexing results still held their consistency even for highest binning settings used. I expected some drop off with the consistency of the orientation when I dropped my binning to 10×10, 16×16, and even 18×18 and it did not fully materialize (Fig. 3). The range did broaden in the Euler Angles, specifically ᶲ₂’s range increased to 3 degrees, but that is change of <1% given the entire range for ᶲ₂ is 360 degrees. Table 1 shows the data is the raw form. Overall, the data is great, from low to high binning with minimal loss in in our indexing metrics (CI and Fit) and consistency in Euler Angles except for the 18×18 binning. That is where we have found our limit, specifically when it comes to indexing metrics. We see a sharp drop off in the CI. The pixilation of the pattern has gotten to a point where it is difficult to find a unique solution. This drop off is why we tell our customer that 16×16 is the limit of binning they should use for reliable, high quality data. Table 1. Indexing Metrics and Euler Angles for all data points. 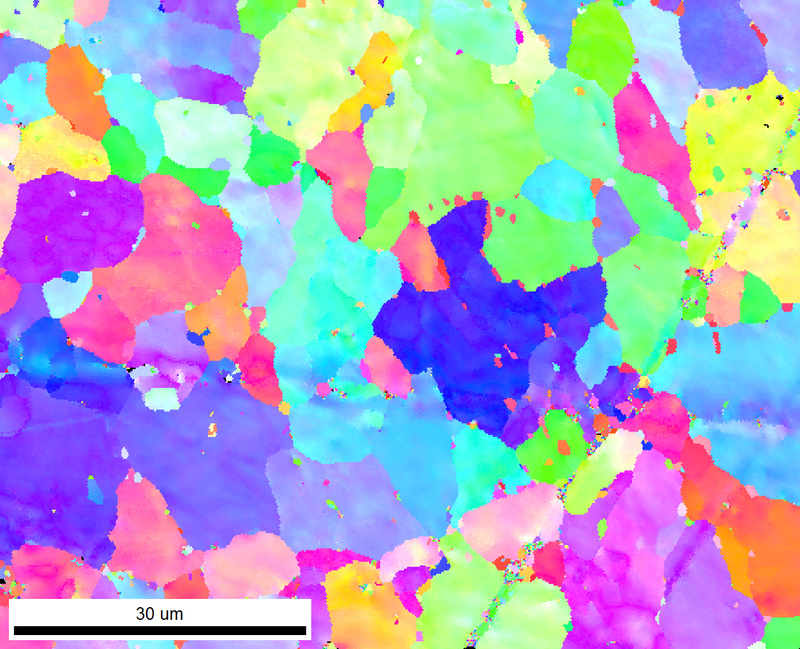 With all that said, most EBSD work is not on a single orientation, but a map. Does this hold true on a map? It does. In Figure 4 and Figure 5, we can see the mapping results for 2×2 binning and 10×10 binning. Both indexed at 99.9% with their average CI’s being 0.89 and 0.84 respectively, with very little change in orientations. This level of data quality across binnings is why EDAX uses the Hough. It is an amazing little tool. Figure 4. This map was taken at 2×2 binning. Internal deformation of the grains is visible, with inclusions between relatively undeformed. Figure 5. This map was taken at 10×10 binning in approximately the same area as Figure 4. Again, internal deformation is showed in the larger grain, while the inclusions are undeformed.